Brett Gladstone, the great, great grandson of Ida & Isidor Strauss - who perished on the Titanic 100 years ago - speaks at the Anniversary ceremony on Apr. 15th, 2012. MANHATTAN — One hundred years ago, a love story unfolded in the frigid waters of the North Atlantic. Isidor Straus, the wealthy co-owner of Macy's and his wife Ida, were aboard the tragic Titanic, the ship believed to be unsinkable, but was torn asunder by an iceberg. As water poured into the doomed vessel, Isidor gave up his spot on a lifeboat because women and children were on board. Ida gave up hers because she did not want to live her husband's side. They died together that night. On Sunday, nearly two hundred people packed into the tiny Upper West Side park named in their honor to attend a moving ceremony dedicated to their sacrifice. Brett Gladstone, the great, great grandson of the wealthy couple, spoke of the selflessness that tragic night that helped saves the lives of many people. 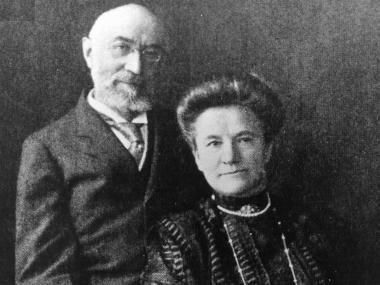 Isidor and Ida Straus, in 1910, two years before they died side by side on the Titanic. "I'm deeply honored to here today," said Gladstone, a lawyer who lives in San Francisco, Calif. "It's touching to know that people all over the world still find this story important. "They had a wonderful life together and their love will live on forever. It's an heroic story about undying love, chivalry, honor and of course romance." During the event, he spoke about the Straus family history and fondly recounted the last moments of his great, great grandparents. 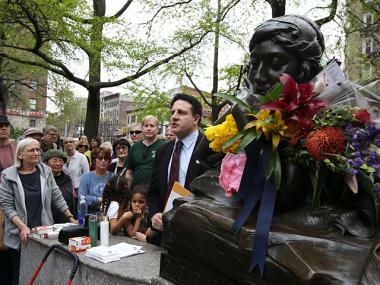 Residents lit candles and listened to music that was played on the doomed vessel, including "Nearer My God to Thee" — supposedly the last hymn played before the ship sank — and also saw two "Redbud" trees planted in the southeast corner of the park. "The trees are from Oklahoma and they are always the first trees to blossom every spring," said Joseph Arbo, 57, a resident who planted the trees. "We picked them because they have heart shaped leaves and they'll hopefully be here for the next one hundred (100) years."